There are a lot of sports covered within the world of fantasy sports, but not all of these are covered when it comes to daily fantasy sports. Most sites cover the big four: MLB, NHL, NBA, and NFL. Some college sports are covered, too: basketball and football. Beyond this, it can be difficult to find other sports, but PGA, NASCAR, and MMA are also available at some fantasy websites. Each sport has some slightly different aspects, but for the most part, the methods that sites use to score these sports is pretty much the same. Let’s take a look at the three most popular sports, and see what you need to know to be successful while playing in a one day fantasy league. Baseball was arguably the first sport to be played in a fantasy setting, and as a result, it was one of the first sports to gain popularity as a single day fantasy sport. There are reasons for this: there’s a huge list of players to choose from, you can play every single day for months if you wish, and there are so many different resources out there when it comes to baseball statistics analysis. Stats here can both help you and hurt you. Homeruns are worth a lot, but strikeouts take points away. So, if you are going with a homer heavy player, you need to ensure that they are not a strikeout heavy player, too. Little things like this will help you to make better decisions when drafting players, and give you a tiny edge over the competition. You will need to draft offense heavy players, but pitchers are a necessity, too. Strikeout numbers for pitchers are the best judge of talent here, but some leagues do reward you for having pitchers that can go into later innings. 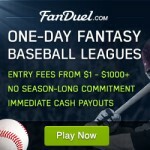 This is the second most widely played fantasy sport, and it has gained a huge following. Again, there are stats that can help you and stats that can hurt you, but there is very little focus on defense. Your goal should be to pick up top quarterbacks since they are high point scorers in theory. Other positions are heavily awarded points, too, but not with the same consistency. Matchups are much more important when playing in an NFL league since players are impacted more in this sport than they are with other sports, especially quarterbacks. The trick, though, is to find players that are undervalued because of weak matchups, as well as the players that are overvalued by tough matchups. The NFL, because of having fewer games and less reliable stats, has a high amount of variance, which makes one day leagues a bit tougher to master here than in other sports. The NBA daily leagues will be quite popular, but most fantasy managers don’t quite grasp how to draft teams in the best way. Like every other league, value is key because it allows you to spread your talent out across multiple players. Some players will perform very well, but by spending money on them, you are losing points elsewhere. Top names will be extremely expensive, but you can often find even more points if you spread that salary out over a few other lesser stars. Teams are small enough that you can draft all great players, outscore your opponents, but never have a LeBron James or Kevin Durant on your team. It’s a balancing act, but one that isn’t tough to master. Taking some time to look at your site of choice’s scoring format to see what is scored highest and what is penalized will allow you to gain yet another edge over other fantasy managers.